I love/hate this WOD, but mostly love. At about round 4 I could not believe I had 11 more sets to go. At that point my arms were killing me from the push ups, so I made it an effort to go as fast as possible on my pull ups and squats- and surprisingly I killed it both of those segments. All but the last round I didn't break up pull ups or squats, just did them straight with no break. The push ups were another story. I would do 3, then rest, do 3 then rest... etc. My arms pretty much failing, I knocked it down sets of 2 + rest, and then the last round I was doing 1 pushup, then resting. My last set of squats I blasted through them. Then I collapsed and felt all the heat coming off of my body. I didn't move from my spot for awhile. I ended up outside, sitting in the setting sun's light. I started to feel light headed and whoozy. At this point it's been about 10 minutes since I finished the WOD. CR got me some water and I felt better. I don't think I ate enough carbs to day. I usually have 4 servings of fruit a day I only had 2 servings in one sitting. I think I did well. 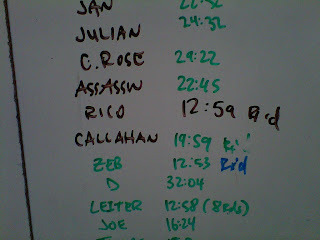 A lot of the men killed the wod with sub 20 min times. Like Zeb and Rico. 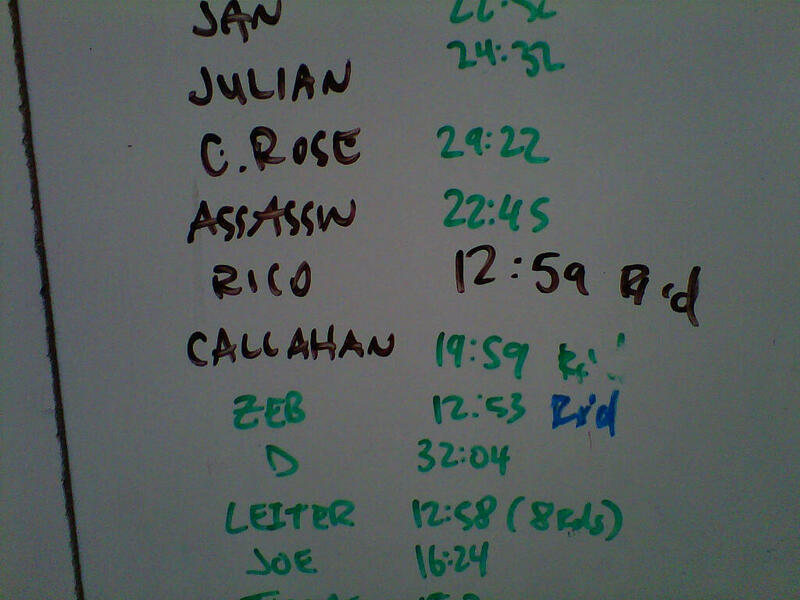 That's like a 50 seconds per round, like, really? It's friggin' awesome. Now at home, my body is throbbing from the 4 classes I did this week. My left calf is jacked, my abs are sore, my shoulders are tight, and now my arms and pecs are screaming. Awesome. Time to par-tay! Now I'm getting excited about tomorrow evening. I can't wait to introduce certain people to certain people. I love everyone I know and I think most will hit it off with each other. Like Suzy and Carla. Maybe Chris for Crose--hey now! I hope Dakota and Melsie will get off of work early so they can get down with us... and the cake, I can't wait to see it. It's a surprise cake, but I told Kota what kind of cake I like. The taping of Kababayan LA was nerve racking. I was trying to get out of doing it all the way to the last second, using the excuse that I don't speak tagalog. It didn't fly. I was going to be on that stage. I was sweaty and my thoughts were going a million miles an hour in my head... I don't want to relive it. It's over. Thank goodness.